The works of art in Sacred Heart University's Gallery of Contemporary Art exhibit, "Contemporary Souvenirs," give credence to the adage -- "One person's trash will be another's treasure." Curated by Laura Einstein, the exhibit at the Fairfield gallery runs from Jan. 23 to March 3, with an opening reception Jan. 23 from 1 to 3:30 p.m. A panel discussion will follow at 3:30 p.m. The exhibit showcases the transformation of remnants -- air-conditioning filters, record albums, construction site materials, deer netting, receipts and more -- into works of art. Artists are June Ahrens of New Canaan, Ula Einstein of New York City, Joseph Fucigna of Wilton, Constance Old of New Canaan and Paul Villinski of Long Island City, N.Y.
Ahrens is known largely for her installations. "Passage" is a 26-foot-long installation made of recycled beverage and vitamin bottles, stones, industrial glue and steel wire. Ahrens' "Flow" incorporates the wispy tendrils of fiberglass from cobalt blue air-conditioning filters to create a vivid blue-framed wall piece. Eubsteub, a Swiss-born multi-disciplinary artist, offers her Tyvek series "Scales," "Detectable TRACES," "W(e)aring Her Tracks" and "Currents" that exemplify her desire to stretch everything beyond its original purpose. Tyvek provides a lightweight, durable structure whose pliability provides her with an opportunity to appropriate a material meant originally to sheath houses in a protective cover. Fucigna is a mixed-media artist who creates abstract wall constructions using, for this exhibition, colored plastic fencing and deer netting. Layers are folded, hung and bunched together to create abstract forms that deal with issues of line, shape, texture and color. Fucigna brings "Orange/Green/Orange" and "Untitled" to the exhibit. Old captures the spirit of the 21st century by taking advantage of the excesses of the consumer economy. Choosing receipts and miscellaneous plastic items rather than scraps of cloth, she transforms the 18th-century North American tradition of rug hooking into "Sea of Blue: Plastic Floats Forever" and "Floats," creating three-dimensional wall pieces out of found color. 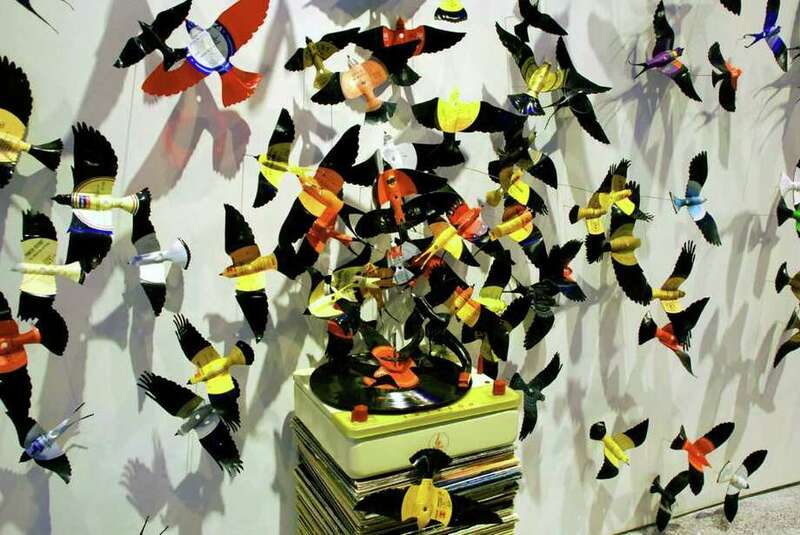 In "Diaspora," Villinski is interested in the implied motion of the flutter of the wings of specific species of birds as he cuts and carves actual vintage record albums for a large installation of 10-plus feet of birds emanating from a central core of record album covers. Of "Idyll" is an installation piece that is made from flattened beer cans that Villinski transforms with tin snips, files and fingers. For more information, call Gallery of Contemporary Art Director Sophia Gevas at 203-365-7650, or e-mail her at gevass@sacredheart.edu.